But in my few precious moments with Sharon, she ingratiated herself to me permanently by being the only other person I have ever met (who is not related to me) to have seen and loved the movie Raising Arizona. We are now BFFs. 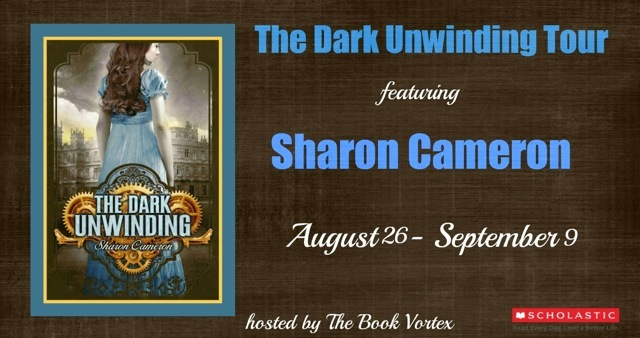 So today, I am excited to bring you an interview with Sharon! I kind of got carried away with my questions and sent her quadruple the amount I was supposed to. Oops. But she was, again, awesome and picked her favorites to answer. I think her answers are pretty spiffy, myself. Oh, and at the end, there’s a chance to win pretty and shiny swag! 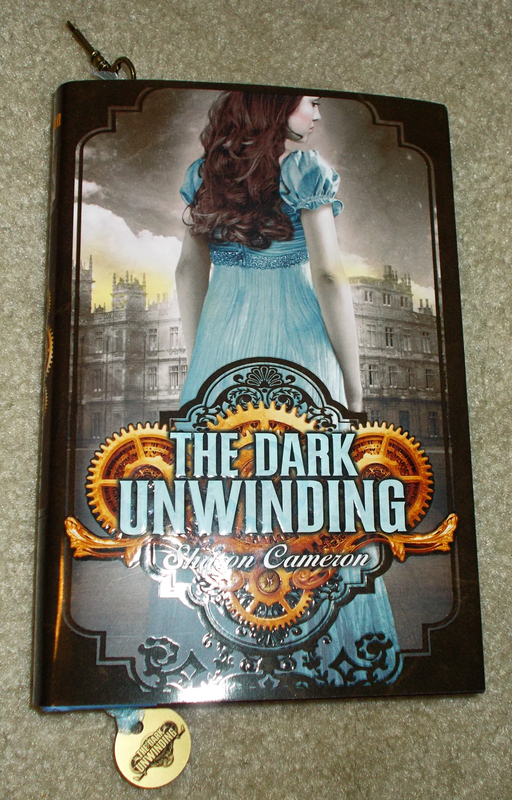 1) How long did it take to write The Dark Unwinding? hope to shake the dust off it someday! favorite scene in The Dark Unwinding? 4) What’s the best piece of writing advice you’ve ever received? weren’t resonating with me. It made me much more perceptive as a writer. 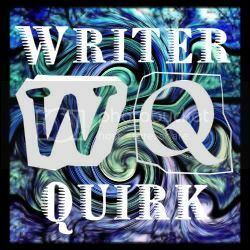 5) What’s next for you as an author? The Dark Unwinding the sequel! 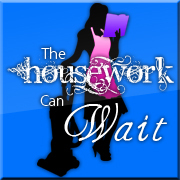 Look for more info coming soon! 8) Best book you’ve read in the past 12 months. 9) Most recent movie, TV show or book that made you cry. Oh, gee. The unfortunate truth is, they all do. Happy or sad. It’s humiliating, really. THCW: I pressed her on Twitter for a REAL answer to this one, and turns out it was a Publix commercial. I feel ya, Sharon. Those things are brutal. Seriously. 10) Reality show you’d have the best chance of winning. The Amazing Race. I am positive I would rock that and win a million bucks. Thanks so much for joining me on my blog today, Sharon! I’m so happy I could be part of your tour, and I wish you and The Dark Unwinding oodles of success! The Dark Unwinding begins when seventeen year old Katharine Tulman is sent to her uncle’s remote and bizarre estate to have him committed to an asylum. 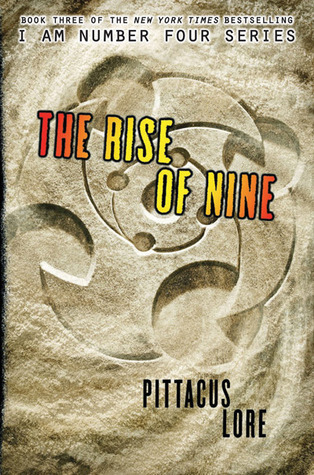 But instead of a lunatic, she finds a child-like, genius inventor with his own set of rules, employing a village of nine hundred people rescued from the workhouses of London. Katharine is torn between protecting her own inheritance and preserving her uncle’s peculiar world that she has come to care for deeply, a choice made even more complicated by a gray-eyed apprentice, and the strange visions and nightmares that have her secretly fearing for her own sanity. And now for some fun swag! 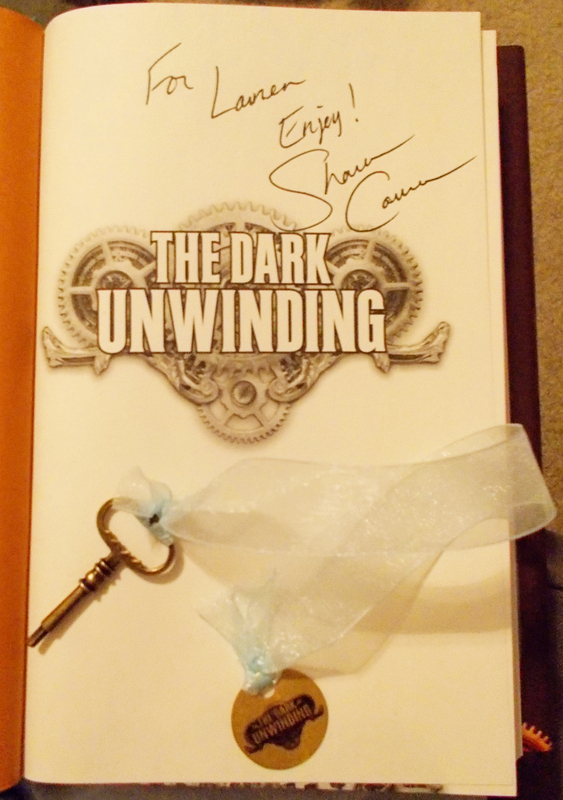 Sharon is going to send 10 lucky winners a beautiful ribbon bookmark, perfectly tailored to match your copy of The Dark Unwinding. 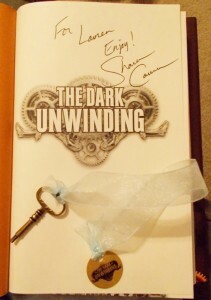 There’s a key at one end and a metal disk with the title and gears at the other, tied with either a satin or organdy ribbon in light blue (to match the cover model’s dress, of course). I used my copy of the book to model the bookmark for you. But don’t get excited. It’s my book. You can get your own. The ribbon is light blue. I swear. It fits the book perfectly! You know you want one. Guys, this recommendation is pretty much exclusively for fans of Star Trek: The Next Generation. So if that’s not you, sorry. Also, if that’s not you, what’s wrong with you? Anyway. For those of you who are interested…Michael Dorn wrote a book. 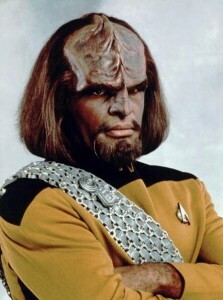 Michael Dorn. Wrote. A book. 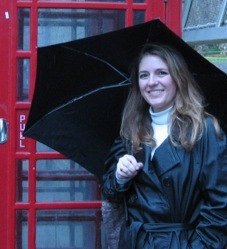 I really wish this was the author photo on the back of the book. And the premise is, more or less, Black Indiana Jones + TIME TRAVEL. Worf wrote a time travel book featuring Black Indiana Jones. Let’s all just bask in the gloriousness of the fact that this book exists. 1) Today is my birthday, so I thought it was appropriate that I feature a book I got as a birthday present when I turned 17. No, I’m not going to tell you how old I am today. Older than 17. That’s all you’re getting. It is not great literature or mind-blowing sci-fi. It ends with a big “TO BE CONTINUED” and it was never continued. And it’s been a few years, but I think it may actually end on a literal cliffhanger. As in, a person hanging off a cliff. So be warned about that one. But it’s a fun quick read (I’ve read far worse sci-fi), the premise is really amusing, and it was written by my favorite Klingon. It entertained me immensely, and now if I ever meet Michael Dorn, I can say I read his book. And that’s really all I needed. Oh, also, ALSO, this. Which has nothing to do with this book, except, WORF. This is a Blog Hop! 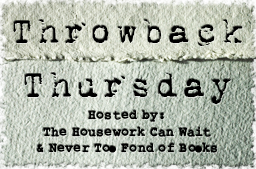 Link up your Throwback Thursday posts below! Discussion: Multiple POVs: Tool or Crutch? I’ve been reading a lot of books lately where the narrative follows multiple POVs (points of view. Which I guess means the abbreviation should be PsOV, but that looks WEIRD). Sometimes it’s just two characters, other times it’s four or more. Then I go to other blogs or Goodreads and see what others thought of the book. One of the things I’ve noticed come up in reviews a lot, with feelings running the gamut of emotions, is that we have widely varying preferences on POV. Some people love the additional insight into the characters that multiple POVs offer. Others think of it as authorial laziness, and wish the author would just stick with one character and develop him or her more. With me, it really depends on the book. Sometimes I adore multiple POVs. Other times, I agree that it feels like the author just wasn’t trying very hard. Or there’s a third category — the author obviously had a strong case for including someone else’s POV, but their editor probably needed to step up and cut it. Because while the added POV does add something interesting to the story, it doesn’t add enough to justify its presence. Let’s take a look at some books that fall into each of these categories, and why, in my opinion, they work or don’t work. To me, Robin Hobb’s Liveship Traders trilogy is the gold standard of multiple POVs used to great benefit. This is an adult high fantasy series, and I think one of the things working in its favor is the scope of the story (and the fact that adult high fantasy is allowed to have some length to it). Probably many of you haven’t read this one (although you SHOULD), but just bear with me a moment while I walk through the elements that make multiple POVs work well. I’ll apply them to books you’ve read soon, I promise. This series has seven POVs, and that’s assuming I didn’t miss one. But all of them are very different, following characters that come from varied backgrounds, each with their own unique voice. Yes, some of them are paired up in the same location, but none of them has all the information necessary to make the story work. Kennit is incapable of telling the reader what is happening in the town, because he spends the majority of the book on his ship. Brashin can’t tell you what’s happening on Kennit’s ship, because he’s on a different ship. And Ronica can’t tell us a thing about life at sea, because she remains in the town. Now I’m not saying that characters must be divided geographically for multiple POVs to work. It can most definitely work if the characters are in the same location. But what must always be true is that the story can’t be told by only one character. Not that it would be difficult to tell. It needs to be impossible to tell. As in, if you forced the author to rewrite the book from the perspective of one character only, the story simply wouldn’t work. No character’s POV is included unless they have their own unique story that must be shared for us to be able to understand the story as a whole. And as a result, while some characters are featured more prominently than others, every single POV has its own motivations, its own stakes, and its own plot arc. When only one (or none) of the above is true, it just flat out doesn’t work. Here’s some of the common pitfalls I’ve seen. I’m not sure if this is a case of author voice being too strong or character voice being too weak. I think normally, it’s the latter. This is especially prevalent in books where every POV is still told in first person, so you don’t even have helpful names and pronouns to let you know who’s speaking. If I can’t figure out whose story I’m reading, I get frustrated and it’s impossible for me to invest in the story. Or maybe I can figure out who’s talking, but I can’t figure out why they’re talking. If I’m thinking, “Why do I need Steve’s point of view? I already have John’s point of view on the subject, and Steve seems to agree with him,” you’ve lost me. Maybe you’re writing a book about a girl searching for her kidnapped boyfriend. And you think, “Oooh, you know what would be neat? The scene where the boyfriend gets abducted!” And you figure, you can’t do that one from the girl’s point of view, so you write it from the boyfriend’s. And maybe you include a scene or two about the boyfriend huddled in the dark, and the kidnapper punches him in the face a few times, but really, most of the story is about the girl’s search and how she ultimately finds and rescues him. Was the boyfriend’s POV necessary? No, and here’s why. 1) We know he was kidnapped. While the kidnapping scene may be awesome, it doesn’t give us new information, unless the method of his kidnapping was absolutely pivotal to the plot and the girl would have never been able to figure it out on her own. And even if that’s the case, it may still not work (see below). 2) The girl is probably assuming he is scared. And if, when she finds him, his cheek is bruised and his lip is bloody, and he looks haggard, we can pretty well assume the kidnapper roughed him up. It’s not necessary to include the scenes of those things happening, because it is not new information that we would not have had otherwise. Even in reason #1 up above, where the method of kidnapping is essential to the plot, if we never hear something relevant from Boyfriend again, his POV still doesn’t work. The author needed to find another way to let us know what the method of kidnapping was, even if it’s really hard. I’m not going to be invested in a character whose perspective I only share for one or two scenes. A narrator needs to tell a story, not just a single event. And this one is tricky. If it almost works, I can still enjoy the book. Heck, I can even enjoy a book sometimes when it flat out doesn’t work (although in that case, I can’t LOVE the book). When this happens, it’s pretty much always in books featuring three or more POVs. The author has a couple POVs working well, developing characters and arcs alongside each other, bringing us lots of necessary information…and then they slip in another one that’s not necessary. It kind of sneaks in, around all the stuff that is necessary, and it almost fools us into believing that we needed that character’s POV. But we didn’t. And any time we come across that character’s POV, the story starts to feel flat. So basically, the author could have had a solid multiple-POV book, but that one extra narrator kept it from completely working. I can totally see why this happens. Authors love their characters. They want us readers to have ALL the information, because sometimes it’s painful to not show how fully developed and real these characters are in their heads. And when they are letting several other characters have their voice, and they’re all working well, I’d guess it can be extremely hard to see that this one character just isn’t working. But I would argue that there’s a way (albeit much more difficult for the writer) to develop those characters and give us all the necessary information without crawling inside their heads for a couple chapters. I know I’ve read more than two books where it almost worked, but I honestly can’t think of what they were at the moment. It’s a pretty rare occurrence — normally the multiple POVs either work or they don’t. So what do you think? Do you love multiple POVs or hate them? Does it depend on the circumstance? Are they necessary sometimes and superfluous at others? What books can you think of that I didn’t mention here that got it perfectly right (or horribly wrong)? *I know a lot of you may disagree with me on Legend, but I maintain that the narrators in that book sound exactly. The. Same. Welcome to Top Ten Tuesday, hosted by our friends over at The Broke and the Bookish! Today’s topic is dangerous. I’m nervous. But here you go. In no particular order. 1. I dog ear pages. Not in my lovely new hardbacks, but in my old, well-worn paperbacks? You betcha. 2. I’ve been known to use books as coasters. Again, not the shiny new ones. But my old books have taken their share of abuse. 3. I check books out of the library ALL THE TIME without setting aside time to actually read them, and they wind up going back either unread or half finished. Yes. I am that annoying person who has the book you want. And I’m not even reading it. 4. I prefer Jane Austen movies to Jane Austen books. Love her characters and her stories. The books don’t hold my attention the way I wish they did. 7. I didn’t like The Great Gatsby. At all. I don’t even want to see the movie. 8. Although I love all things supernatural in my stories, and I love many of his other books, I’ve tried reading Stephen King’s Dark Tower series twice, and failed both times. Can’t seem to make it past Book 4. 9. I enjoy a well-done love triangle. 10. While I’m not a fan of the actual writing and do think the story is intellectually absurd, I really enjoyed Twilight. And Breaking Dawn was my favorite, even though it makes the least amount of sense and has the worst ending.